Motherwell played out a 0-0 draw against St Johnstone in Perth on Saturday in their final game before the Scottish Premiership split. It's safe to say that describing the uninspiring first half as a fantastic festival of football festooned with goalmouth action would be being more than slightly economical with the truth. A low key affair in front of just 2409 fans featured an opening 45 minutes with very little to cheer about, which had this reporter going to fetch a half-time pie 10 minutes early. Curtis Main flashed a long range shot wide for Motherwell after 25 minutes, with Saints' Murray Davidson shooting just off target at the other end after a 44th minute pass inside by Steven MacLean. After such a drab opening half, things could only improve in the second period. Motherwell goalie Trevor Carson was called into action to make a fine early save from David Wotherspoon following Scott Tanser's delivery from the left. Visiting defender Cedric Kipre was booked for a foul on Chris Kane, before Wotherspoon sent the resultant free-kick wide. Main then produced his best moment of the match on 52 minutes when he cut inside impressively and sent a right footed effort just wide of Alan Mannus's goal. Saints' Richard Foster saw yellow for a foul on Elliott Frear, before Motherwell manager Stephen Robinson made a double substitution by replacing Frear and Main with Chris Cadden and George Newell. Tanser shot off target for the hosts after cutting inside, before the Steelmen had an effort miss the goal at the other end when defender Tom Aldred nodded Maguire's cross from the left wide. Andy Rose for Maguire was 'Well's final substitution on 72 minutes, with Rose getting booed within two minutes for a foul on Saints sub Matty Willock. Bigirimana was then fouled by Davidson, which saw referee Willie Collum again reach for his notebook. And it was Bigi who hit a 79th minute free-kick which Mannus unconvincingly turned round his right post for a corner. There was then a dangerous Saints raid which saw Motherwell's McHugh make a last ditch tackle on Kane before the ball was cleared to Davidson whose effort hit McHugh's head and went wide at the expense of a corner. 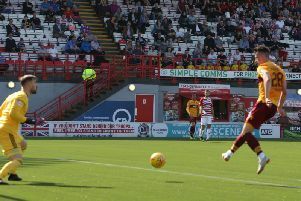 A late Motherwell chance saw a fine run and cross by Bigirimana on the left set up Liam Grimshaw at the back post but his shot was cleared from near the goal line by defender Steven Anderson. Motherwell: Carson, Tait, Grimshaw, Bigirimana, McHugh, Main (Newell 62), Frear (Cadden 62), Bowman, Aldred, Kipre, Maguire (Rose 72).